I'm a passionate food blogger, keen photographer and international cuisine lover. I strive to provide comprehensive and honest reviews of restaurants, cafés, bars, pubs, festivals and products to whet your appetite. Look out for the label SIMON FAVOURITE :-) for dishes I highly recommend you try. Please feel free to provide comments to share your experiences or recommend places or dishes you think I should try. I'm sure I can't be right 100% right all of the time so please keep me updated. My main goal for this blog is to share information about food, and hopefully where to find the best and most authentic of all cuisines available. 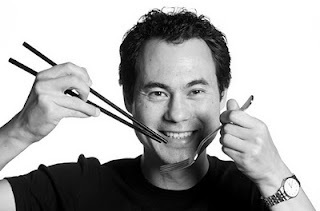 For extra information about Simon Food Favourites check out my Q&A Interview (with myself). I'll always try and credit who recommended a place for me to try if I remember — I think it's only fair. My aim is to respond to all comments and email inquiries when time permits. I also email a link of my review to the restaurant when an email address is available so they're aware of what I've written about them. I think it's important for restaurants to know in case there's something they might not be aware of from an outsiders point of view and also to stand behind what I say. If I wouldn't say something in person then I wouldn't write it in my review and I'm always happy to be corrected. My preference is to dine anonymously and pay for my own meals unless of course I've been invited to do a guest review.